#AMAZONFASHION BASH Buy fashion products at best discount ever – fashion accessories are available even for RS 1. Amazon.in presents amazon fashion bash which provides fashion products and accessories at very cheap price. Buy fashion accessories , clothing, and shoes at very discount price on amazon.in . 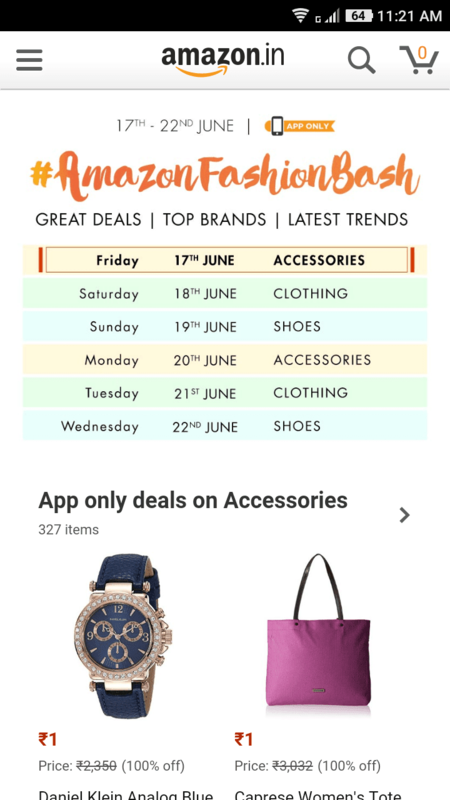 The amazon fashion bash starts on 17th june and ends on 22nd june. The discount sale is started now. There are many products are available even at rs 1. So, this is a good opportunity, so grab the deals before it ends. The products are limited in stocks, so buy fast. 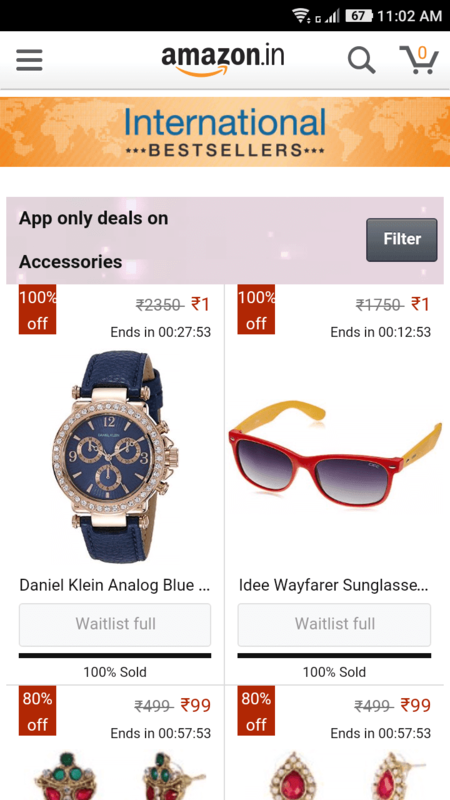 These offers are only available for amazon app users. so you need to download amazon app for availing this offers. The complete steps and details are given below. Read below tricks to buy amazon fashion bash products easily. What is Amazon Fashion Bash : Buy fashion products at very cheap price. Starting from RS 1. 3. At first page, you can see a badge ‘#amazonfashionbash’ . tap on it. 4. On the next page, you can browse the discount products. 5. Add the products to cart as soon as possible. And do check out. Tip – stay on the page deal page. keep refreshing. There are new products coming at every minute. Amazon treasure hunt is an another campaign runs buy amazon now. that buy products at rs 1. amazon provides a clue and the user need to solve it. Note – amazon treasure hunt also available in amazon app. Share this deal with your friends and help them too. This is a very good opportunity for online shoppers. It is started. then what is you are waiting for??? go and grab the cheap fashion products deals. best of luck.